GoPens.com | Don’t Forget Your Fountain Pen! Don’t Forget Your Fountain Pen! We’ve all done it. We use a fountain pen at a desk, in the office, at a coffee shop, or even a friend’s house, and something calls our attention away. We leave… without our fountain pen! 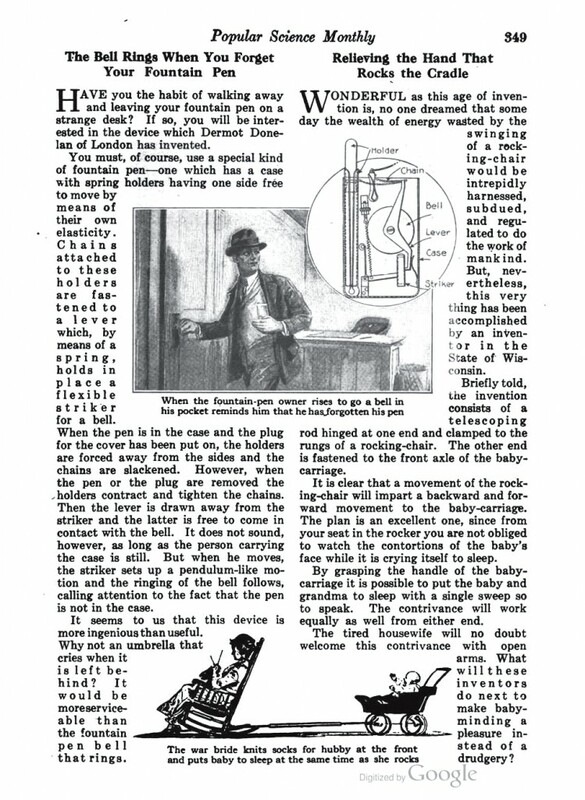 Popular Science Monthly in 1918 showcased a device by Dermot Donelane designed to remind you if you were leaving your fountain pen behind. It was a two-part system, consisting of a special fountain pen and a special case. The case had a “pendulum” striker and a bell within. When the pen was in the case and the cover was on, the chains in the system were loose and the bell would not ring. When the pen was removed the chains would tighten. Even with the pen removed it was not a noisy system — as long as the user was at his or her desk, writing. However, should they stand up to leave their desk without first replacing the pen in the holder, the rocking pendulum striker would ring the bell, reminding the user to take their fountain pen! As the article admits, maybe more ingenious than useful. I am not entirely certain I would have purchased a fountain pen based on its ability to fit into a special case. Have you ever left a fountain pen – or any pen – behind? Would something like this benefit you?